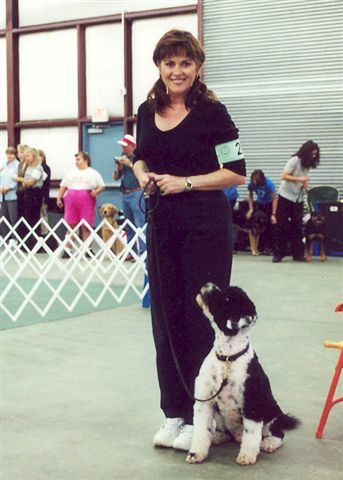 Lindy Nolan, CPDT-KA , is one of the premier dog trainers in South Florida. Training animals has been a lifelong passion for her. Her "students" have been diverse: from dogs, cats and birds to horses, goats, cows, and pigs! Since she graduated from FAU, she has trained animals professionally for 40 years. Initially, Lindy taught Dressage (ballet-like gymnastic training for horses), and this training is very similar to modern techniques in dog performance training. During these 10 years, Lindy was training and showing her own dogs as well. Many people asked her who had trained her dogs, since they were so well-behaved. This made Lindy think that she could make a successful business out of training dogs. At this point she began to take courses, train with her own dogs and study with the most well known and talented people in the dog training arena. Unbeknownst to her this would be in preparation for what would become her business as we see it today. Eventually, both businesses grew to the point that she had to make a choice between Dressage and Dog Training, and she proverbially "went to the dogs." Since then, she has become one of the true masters of dog training. As part of her training philosophy, Lindy believes that a healthy dog is a happy and a productive dog. Not only does she believe that you can help your dog live a longer life but feeding a really quality dog food can help your dog have fewer visits to the veterinarian. She can offer you a full line of high-quality Healthy Pet Net dog food and a variety of pet health care products. These include safe chew bones, supplements, shampoos and more. See our page on Pet Health!